I really didn't like this photo when I shot it, looking in the LCD it was really blah. But after I opened it up on my computer, I could see that I caught some reflections of the tree branches in the water and it started growing on me. I'm often blown away by gorgeous images that I've seen on 2peas of beautiful reflections, and I would love to capture something like that. I really want to learn to look for those reflections, and see them before the shot, not just catch them as an accident. Settings were TV mode, f4, ss 1/500, ISO 400, 50mm lens. CC appreciated! yes, i like your reflections too! i have been thinking about them this week with our water theme but can't seem to come up with any either....good luck! great picture! 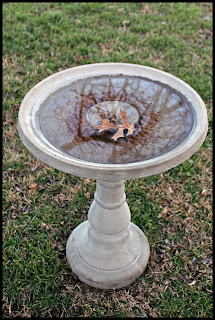 great reflection and mood in this bird bath. I love this! Great water shot! Great reflection in the bird bath, great capture. It's beautiful. I love the composition/the angle on this! It's lovely! I really like the reflection. This is a great capture! The reflection is perfect. A hidden treasure in the camera. Aren't you glad you didn't just delete it from the lcd. Glad you were able to capture it. I love happy accidents! Very pretty reflection! fun picture. good job catching the reflection.